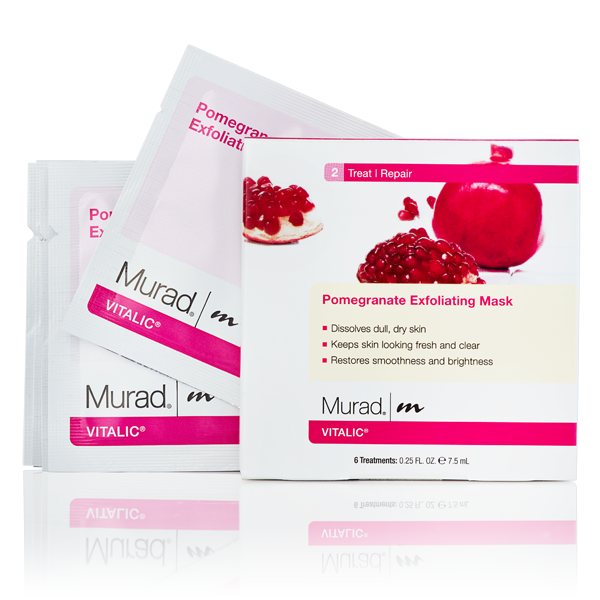 The Pomegranate Exfoliating Mask brings a whole new meaning to exfoliation. The unique formula will revitalise and balance all skin types skin by dissolving tired cells to reveal bright, fresh, youthful-looking skin underneath. This weekly treatment is the perfect way to free skin from dull, dry surface cells and trapped impurities while the antioxidant-rich formula defends skin from harmful free radical damage. You can enjoy a softer, more radiant complexion after just one use. Pamper your way to beautiful, flawless skin. The Pomegranate Exfoliating Mask is the perfect way to enhance any skincare regime and if you’re feeling generous, the perfect gift for a very deserving friend! After cleansing, apply contents of one packet to face and neck. Leave on for 10 to 15 minutes. Rinse thoroughly with warm water and pat dry. 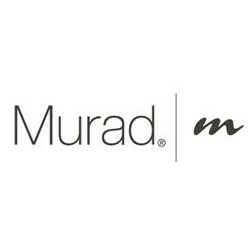 For optimal results, use 1 to 2 times weekly and follow with recommended Murad moisturizer and sunblock. Tip: Try a Pom-Power Pore Cleansing Facial at one of our many salons across the UK and Ireland for an invigorating boost to your skincare regime. Water (Aqua), Sorbitol, Citrus Medica Limonum (Lemon) Fruit Extract, Hydroxyethyl Acrylate/Sodium Acryloyldimethyl Taurate Copolymer, Glycerin, Butylene Glycol, Squalane, Bromelain, Ginkgo Biloba Leaf Extract, Lactic Acid, Cimicifuga Racemosa Root Extract, Punica Granatum Extract, Sodium PCA, Menthoxypropanediol, Punica Granatum Seed Oil, Carica Papaya (Papaya) Fruit Extract, Zinc Gluconate, Tocopheryl Acetate, PEG-40 Hydrogenated Castor Oil, Xanthan Gum, Polysorbate 60, Disodium EDTA, Phenoxyethanol, Caprylyl Glycol, Chlorphenesin, Benzyl Salicylate, Fragrance (Parfum). I had a little splurge at Murad and bought quite a few items, one of the items I got was quite a few of these wonderful face masks. Now I love a good mask, I usually use clay ones but decided to go for something a bit different. Having previously used Murads radiance peel, I thought this would be just as good. Th sachets are really bi and I found I was able to get 3 uses out of 1 sachet, not even needing to scrimp on the product, it covered really well. The serum is clear and easy to massage onto the skin, leaving a light film over the face which dires after a few minutes. My face felt tingly, which is common with Murad facial products, after a couple of minutes, the tingles stopped. Washing off was easy, I just rinsed a few times with lukewarm water, patted dry and applied moisturiser. My skin felt so clean and a little tight, but a good tight. My pores had visibly shrunk and lines appeared slightly reduced. My skin wasn't left dry and I had some radiance after a few weeks of use. I used it once a week for a really deep clean and it stopped me getting spots and blemishes. It stated it was an exfoliation mask, but there was no beads or anything, however I noticed when rinsing off it had taken off the dry skin on my face and came away when washing. So even through it isn't your typical exfoliator, it really does get rid of dead skin. I have to say this is one powerful mask and not to be taken lightly. No idea where the exfoliation comes from but this is a very nice mask anyway. The scent is mildly sweet and the texture is very soft. It's easy to apply and remove. I used this mask with the Murad Essential-C Day Moisture SPF30 | PA+++ which worked well. The results weren't spectacular but pleasant enough. I don't think I'd use it regularly at the price (and the fact that you're suppose to use it twice a week) but it's certainly a nice to have.